Marbella will be in the middle of the focus of the best international amateur padel from March 15 to 17. 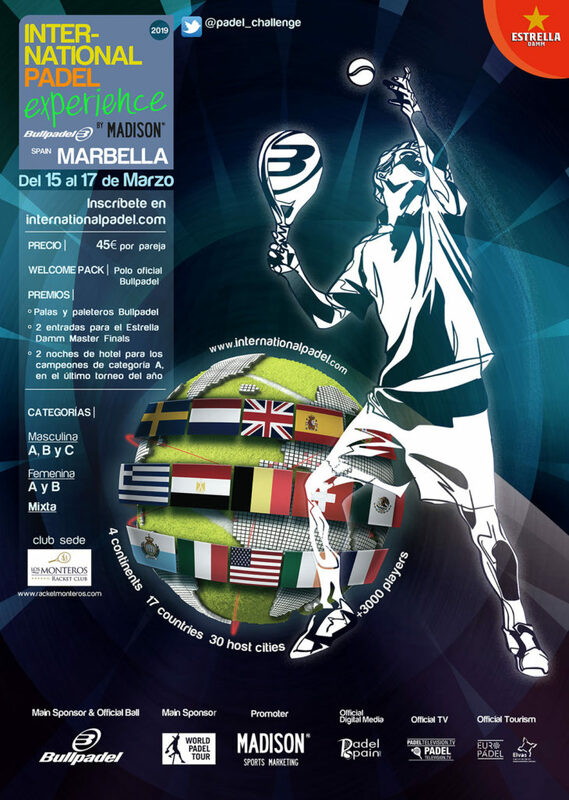 The Monteros Racket Club arrives, for the first time in history, the International Padel Experience by Madison, a circuit that this year will call on 4 continents and will have more than 30 events spread across countries such as Mexico, Egypt, France, Italy, Sweden, Portugal, the United States, Andorra, Ireland or Switzerland, among others. Marbella enters the tour with the enormous impact of opening the season, without a doubt a milestone that will represent a huge return for both the city and the tournament scenario, the unbeatable facilities of Los Monteros Racket Club. The Marbella Open has aroused enormous interest within the planet padel. Not in vain, it is the first time in its eight years of existence, that the International Padel Experience by Madison opens the course in the prized Costa del Sol, an environment that perfectly combines the international values ​​that distills the circuit. This year, Los Monteros Racket Club will be one of the four exclusive Spanish cities that will host an IPE by Madison event. The rest of the tournaments will be disputed in the more than 20 countries that the project will visit this year. As a complement to the sport proposal, Madison will launch a personalized offer for different destinations in Europe, so that Marbella can be as many international couples as possible, in addition to local players who will enjoy the tournament, which will have 3 male categories , two female and one mixed, which will facilitate the registration as much as possible, as there is room for all levels of play. As usual in the International Padel Experience by Madison tournaments, players will enjoy an event with all the details taken care of to the extreme, so that the protagonists will live an unforgettable experience. In 2018, the circuit accumulated a global participation of more than 2,500 players and the forecast is that this number will surpass 3,000 in 2019. The champions of the highest category will receive as a prize the invitation to compete in the final Master, a tournament that will win the rest of the tournaments and represents the best meeting point for amateur players worldwide. In addition, the winners will get as a prize Bullpadel high-end shovels, main sponsor of the circuit, and two tickets to witness the Estrella Damm Master Final, which closes the professional season in the month of December. During the event, all participants will be able to taste the quality of Estrella Damm beer, main sponsor of the IPE by Madison, in the rest area enabled so that they can regain strength during the tournament. (Español) ¿Por qué Valladolid es la Capital del Pádel?